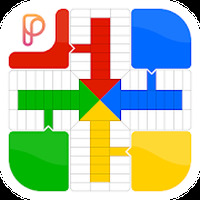 "Enjoy the classic Parcheesi, now interacts with Facebook"
Game Goal: You have to play to get parchis and go all around the board with all your chips before all your rivals do so. How to play: The game is connected with Facebook and other Android users, letting you play against friends and family members in multiplayer games or even 2 on 2. Graphics: Good-quality graphics, with fun animations for the game moves. Sound: Good-quality sounds, with a great variety of audio effects and animations. Controls: You control it by pressing on the touch screen, both to throw the dice and to move a piece. Installation requirements: A minimum of 47M of free memory space and Android 3.0 or higher. Ranking: The TOP 10 Most downloaded games in Turn Based Games category. You can chat with your opponents. A simple and very addictive game. Do you like Parcheesi USA?